This Educational Technology Institute is offered through the NASA Armstrong Flight Research Center, which provides formal and informal educators with NASA resources and materials that support STEM learning. This day long Institute will cover the concepts of circuits, coding and robotics while relating them back to the current NASA research projects. Learn about NASA's X-57 Maxwell Electric Plane while learning about the basics of how circuits work. Educators will engage in mathematics, science and engineering activities about circuits, circuitry, alternative energy, and batteries. Learn how to create, build and test simple circuits. Leave with hands-on activities for students that combine math, science, engineering, and technology. Join us for hands-on experiments and physical demonstrations and learn about how coding is used in current research projects. Learn about the Prandtl glider and how interns have assisted in this research. Be on of the first to see a new Aeronautics App. Learn how to create, code and build Bristle Bots and Little Bits. Take away lessons that use with low-tech or no-tech that promotes coding in the classroom. 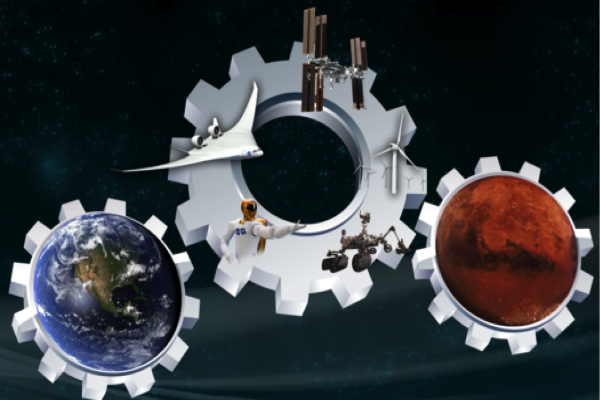 Learn about Canadarm and Mars Rovers. Design and construct a robotic arm using Styrofoam cups while developing an understanding of engineering design and of the roles of troubleshooting, research and development, invention and innovation, and experimentation in problem solving. Learn about programming for the classroom. Engage with BEE-BOT, BLUE-BOT, Sphero SPRK+, and Sphero BOLT robots. Engage in hands-on, standards-aligned mathematics, science & engineering activities as you program robots, predict its performance and chance of mission success, and test drive it. This educational activity aligns to the Co-STEM Priority Goal to improve STEM Instruction by supporting the existing STEM teacher workforce. Please note: As part of gaining access to NASA Neil A. Armstrong Flight Research Center on Edwards Air Force Base, you must be a US Citizen and pass a security background check. ALL Security information must be received within 24 hours of registration. Please note this event is a Face to Face Event and is located in Edwards, California. Transportation is your responsibility.